The Katikies Hotel, located on the cliffs of Oia, at 91 meters from the blue waters of the Aegean, houses 2 restaurants, the restaurant bar Seltz Champagne and the Mikrasia. 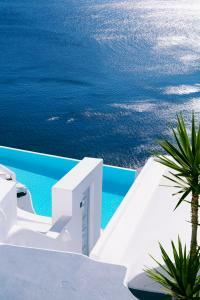 It has infinity pools with panoramic views of the Caldera. Decorated in white with an open-plan bedroom and living area, a bathroom with shower and a private veranda with stunning views of the Aegean Sea and the volcano. Upon arrival, a complimentary bottle of white wine is offered. The hotel has a personalized concierge service. Please note that extra beds can not be added in this room type. The suites have a separate bedroom (some located in a loft) and a seating area. 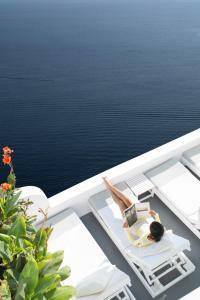 They open onto a private veranda with panoramic views of the caldera and the Aegean Sea. Attic bedroom with luxury bathroom, equipped with whirlpool bath. From all the porches there are fantastic views of the caldera. Large suite, elegantly furnished. It has a luxury bathroom with a spa bath. It opens onto a large private terrace with panoramic views of the sea and the caldera. 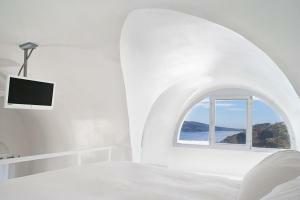 This contemporary design room has a hot tub with stunning views of the Caldera. 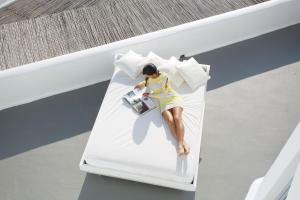 It includes an elegant seating and dining area, a luxury bathroom and a private veranda with sea views. A bottle of Santorini wine and a free basket of fruits are offered upon arrival. - 1 Santorini wine bottle and a fruit basket on arrival. - American a la carte breakfast with champagne on the porch. - Personal mobile phone (will be provided upon arrival). - Check in / out before / after the usual (depending on availability). This suite has a balcony, air conditioning and iPod dock.